Hi everyone. 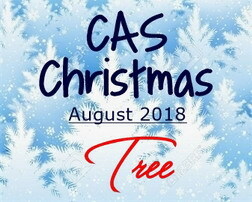 Today is the reminder post for the CAS Christmas August Challenge - Tree. This month's challenge is being hosted by the talented, Hideko. 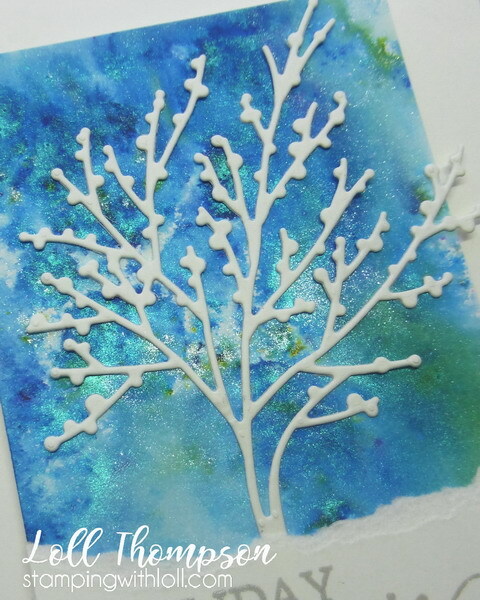 I love the movement of this beautiful die-cut and even though it is considered a winter branch, I though it made a beautiful tree. :) I created a background with Lindy's Magicals. The shimmer and shine is amazing ... close-up below. I cut my panel to size, adhered the winter branch die-cut in white over top of the colourful background, gluing just at the center of the tree so the branches are free-flowing. I tore a thick piece of white card stock for the snowbank and stamped the sentiment in Delicata silver to finish. Easy and fun card to make. There's still one week left to play along with our challenge. 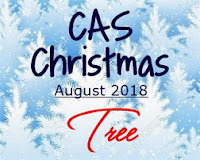 I hope you'll check out the challenge blog to see the reminder post with the amazing Christmas tree cards from our Designers and very talented Guest Designer, Barb. Then come join us in the gallery! Your background is gorgeous, Loll! I love your choice of colors and all the lovely shimmer of the Lindy's Magicals...putting them on my wishlist right now :) Very clever idea to use the branch as your tree! Thank you again for the opportunity to be your Guest Designer for the August challenge...It's been great fun! Oh my, what wonderful shimmer! I really do have to buy more Magicals!! A perfect frosty shimmery background for the lovely tree (I agree, that branch die does make a good tree). Oh, yes, another amazing background, Loll! I love all the glow and beautiful colors that you have mixed. White tree looks amazing on it, so beautifully pops up. I'm going to have to get some of those magicals after seeing this. Spectacular background! Wonderful photography capturing that beautiful shimmer, Loll! Gorgeous shimmery background and love that "swaying" tree like on a blustery winter night! Amazing Magicals background, Loll! I can see the gorgeous shimmer and shine well in the close-up! Magicals have been on my wish but I have a hard time choosing colors (there are so many sets)! Oh how gorgeous Loll - and that tree is fabulous against the wonderful shimmery background. It might have been easy and fun, but it has the most wonderful effect and is a beautiful card. WOW! I see I have a long way to go to master those Lindy's, my friend! Your background is GORGEOUS and the white tree makes it even more beautiful! Love the torn snowbank. I think it looks more realistic than the snowbank dies! Fabulous card! Those Lindy Magicals are so beautiful and love your lovely tree. Hope you are having a great weekend. Glorious shiny background and the white die cut tree/branch looks fabulous against it. Fabulous card Loll X.